I use to always buy the instant oatmeal packets back in the day. I thought they were super healthy and a quality breakfast. But now that I know better (sort of), I know they’re just basically like eating sugar. The maple syrup and cinnamon would always be my favorite, it still is, I love maple, cinnamon and raisin trio. 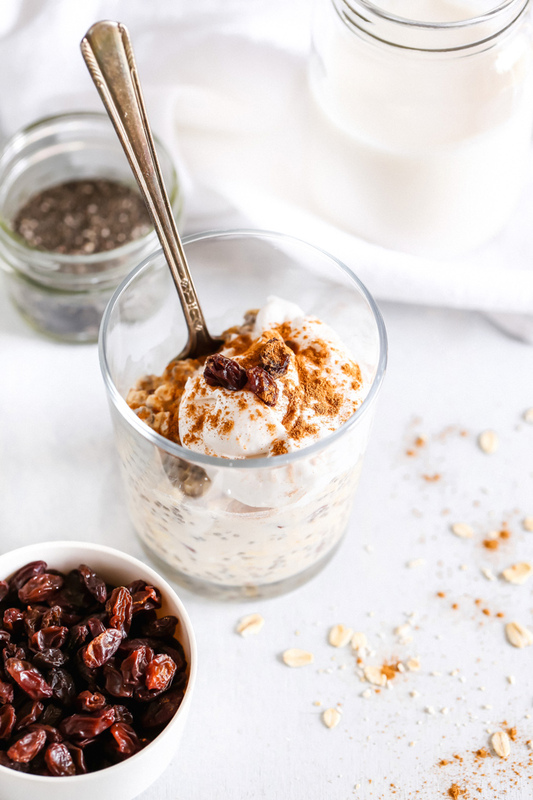 Hence why I make these incredibly delicious Cinnamon Raisin Overnight Oats. 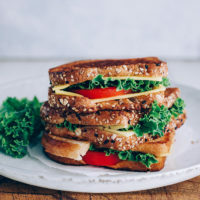 Another easy, good for you recipe that you can make a head of time for busy mornings on the go or if you need more ideas to keep your meal preps not boring. For me, eating the same exact thing every single day would make me nuts. However, I do get on these kicks that when I’m really into something I make it so much I get sick of it but then eventually it finds it’s way back into my heart again somehow. But usually I won’t go nuts again. It’s like when I love a song, I will listen to it on repeat for weeks then be done with it for a while. I’ll still love it but not go cray with it. LOL. I know I’m not the only one. 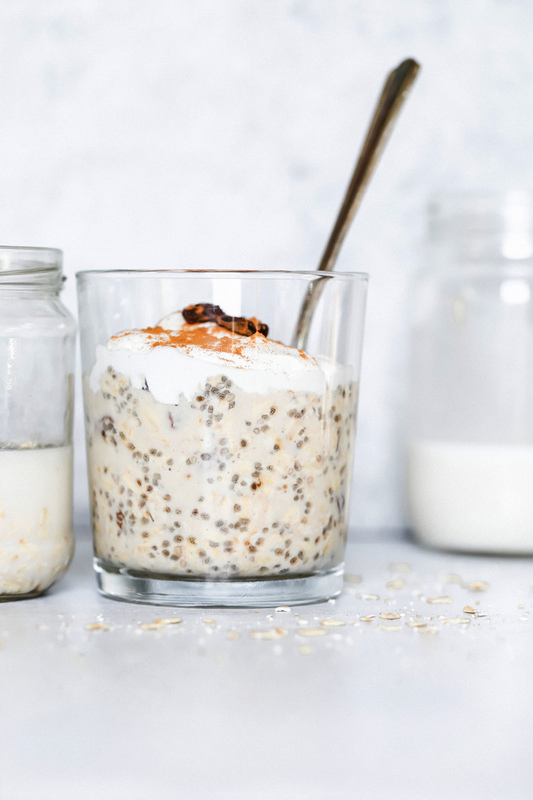 This is one of the simpler recipes for overnight oats ever. You can use this as your guide and make it anything you want. You can add bananas, blueberries, raspberries, almond butter, peanut butter, sun butter, cashew butter (you get where I’m going with this right? ), coconut yogurt, apples, and so much more. I think people just like measurements so the consistency comes out on point. You can even add things like protein powder or psyllium husk. I love using chia seeds, flax seeds and hemp for added plant protein. It comes out all sorts of delish. 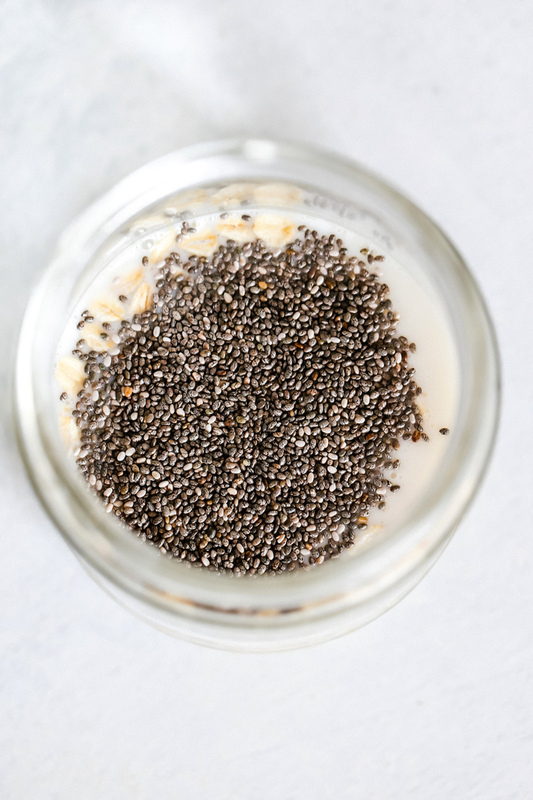 When adding things like chia seeds or psyllium husk you want to make sure you drink plenty of water throughout the day. Take chia seeds for instance. They can absorb up to 10-12 times their weight in water. They expand as psyllium husk does so drinking enough water to keep flushing your system is the goal. 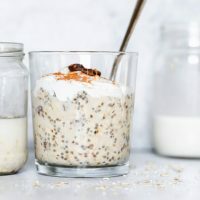 You don’t have to add chia seeds to your oats but I like to add them in not only because of their health benefits but because they give the oats a more creamy, smoothie texture. 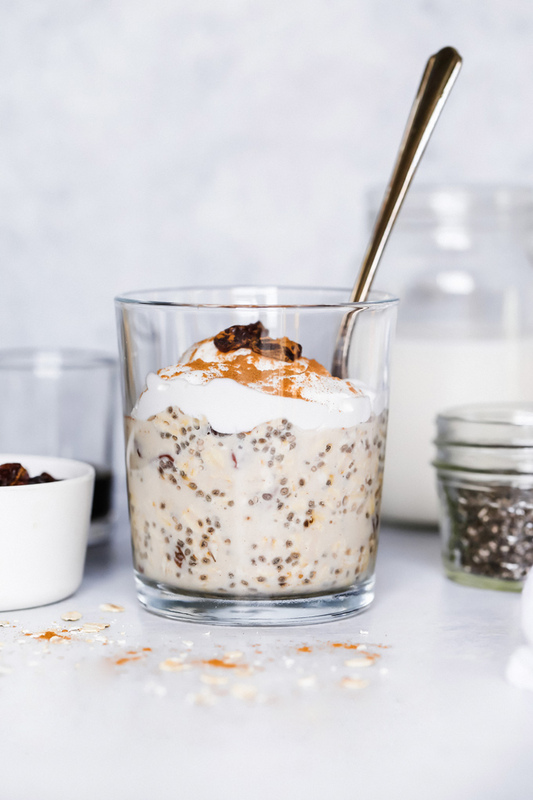 Every have chia seed pudding? Err ma gawd…effin fantastic. With oats like this I like to add a scoop of vegan vanilla protein and for when I’m making something chocolatey I will add chocolate protein. It’s a good way to get protein in and it won’t make it taste like cardboard. FYI Trader Joe’s has a great vanilla and chocolate hemp protein. To sweeten these babies up I use maple syrup. It’s my go to for all things liquid sweetener. It’s not refined sugar like you would find in a candy bar. You can always use something like coconut nectar too that’s low on the glycemic index. Ok can we just get the scoop on raisins for a minute. Super high in fiber and iron. I had to up my iron intake when I was pregnant with Baby O because I was a bit anemic in the beginning of my pregnancy. Raisins were in my hand daily. They’re called “nature’s candy” because they’re naturally super sweet. You don’t have to eat a whole lot of them to gain their benefits. Dried fruits typically are high in sugar so a handful will suffice or something around 1/4 cup. For a “simple” breakfast wouldn’t you say this packs a super high nutritional punch!? You don’t need a lot to make a healthy breakfast or snack even. Overnight oats are amazeballs for snack time too (are people still saying amazeballs?). But like I said, you can make so many varieties and have them prepared for the week, you’ll always have something on hand! You can eat overnight oats cold or warm them up in the morning on the stovetop for 5 minutes. 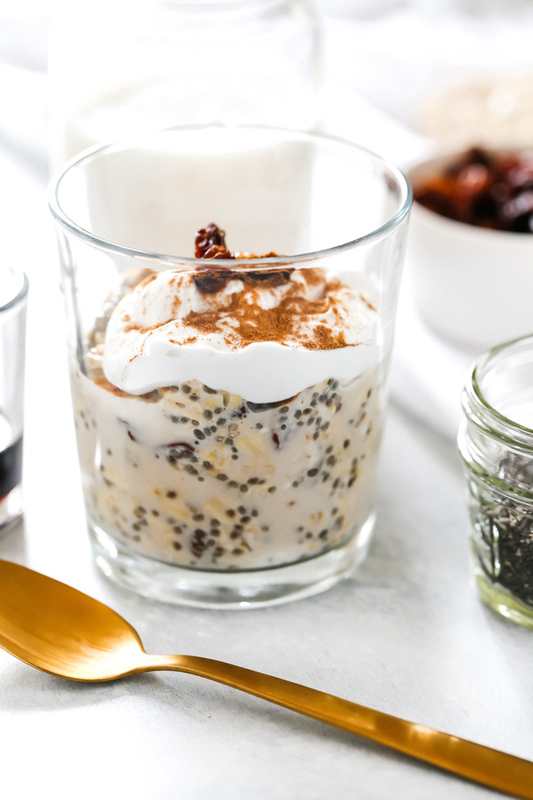 Enjoy a quality breakfast that’s not boring and not processed. 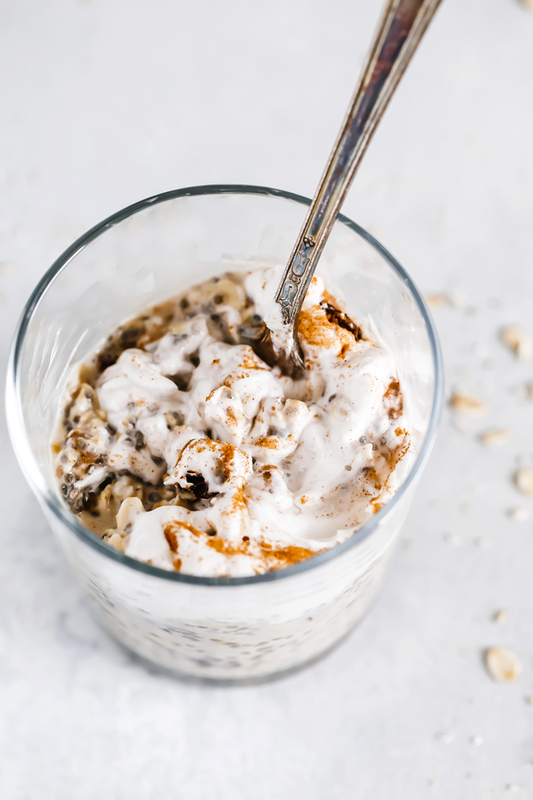 If you’d like more overnight oat recipes check out my Vegan Salted Caramel Blended Oats and my Instant Banana Chocolate Chia Seed Pudding recipes. Creamy oats with warming hints of cinnamon and sweet raisins throughout. Topped with coconut yogurt for added deliciousness. Perfect for on the go or meal prepping. Pour all contents into a jar and mix well. I like to put the lid on it and give it a good shake. 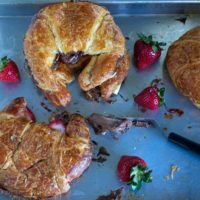 Place in the fridge for 4 hour or overnight (recommended) and serve in the morning warm or cold with your fave latte or tea. Top with your fave fixings like extra raisins, banana slices, or blueberries. This recipe serves 2 so if you need to make more just double or triple it. You can put it in a large bowl give it a good mix and evenly pour it into mason jars. 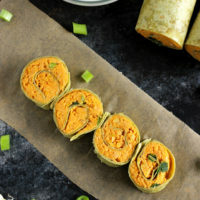 If you want to add things like protein powder or psyllium husk you can add it right in with the rest of the ingredients and let it sit overnight.